Hi all! Hope you had a great Christmas!! I used PJ Emma who was colored entirely with Copics. She’s popped up onto a piece of my fave washi tape. I cut the sentiment with old Quickutz dies out of a piece of white cardstock with another fave washi tape stuck on it. I then machine sewed the letters in place. I hope you like it! And we hope you’ll play along! Don’t forget that you need to use a stamp that’s sold in the ATS Store. TFL! Hi all! If you’re looking for the YNS Hop, it’s the post directly below this one. Thanks! I used the new Love Nuggets sentiment set along with the matching Conversation Hearts dies. A little machine stitching and you’re done! We hope you’ll play along with us! Don’t forget to use a stamp that’s sold in the ATS store! TFL! YNS December New Release Hop! Hi all and welcome to the Your Next Stamp December New Release Blog Hop! We have a mini release for you this month featuring a new stamp collection from Cory Designs called Smiley Happy Critter Crew ! The first set is SO CUTE and guaranteed to make you smile! We also have a new die collection called YNS Whatnots! YNS Whatnots Seasons Set One is jam packed full of small seasonal dies which are awesome for dressing up your cards and tags! Both of these products are available NOW in the Your Next Stamp Store! Warning…both of these collections are highly addictive so be sure to start your collection now as we have lots more coming in 2013! If you’ve come here via Susan's blog then you’re on the right track. However if you just happened upon my blog, you’ll want to start at Julie's blog so you don’t miss anything! The hop runs from today until Saturday, December 15th at midnight EST. We have 3 prize packs hidden amongst the DT Blogs, and you must comment on all of the blogs to win! The winners will be posted on the Your Next Stamp Blog Sunday, December 16th. It’s a little hard to see from the picture, but I die cut the snowflakes out of glitter paper and hand-sewed them to the tag. I stamped both images colored them with Copics and covered the crowns with glitter glue. For the second image, I just added the same crown from the frog to tie them together. Hope you like my projects! We have a Hop Special going on at the YNS Store! Enter code YNSDEC2012 to receive 15% off your entire order! Hi all! I have another Your Next Stamp Fun Friday post for you! This month our theme is Reflection on the last 3 years of YNS. We get to pick our fave images and make projects for you! I’m *very* partial to Furry Dress Up Fhiona and Cute with Wings Dress Up Fhiona because I helped conceive of and design them! And there are matching dies to make playing with them super fun! Today I played with Furry Dress Up to make Fhiona into Rudolph the Red Nosed Reindeer! I used the animal body, face with closed eyes and pointed ears to make this fun Fhiona. You can see I also used an extra ear (just the inner portion) to make her tail and I added antlers by using the Tree Trio die set. The final touches are a 1/8” red punch for her nose and a bit of Trendy Christmas twine. I added a glittery snow line and a sentiment using the Alphadot set from Paper Smooches with little dots of red glitter between the letters. I hope you like it! Don’t forget to check out the YNS Blog for all the other FF projects! This card is also for Papertake Weekly & Loves Rubberstamps– both Anything Goes, Ribbon Carousel – The Holidays, and CASology – Sparkle (I wish the glitter photographed better!). TFL! I used the new Kiki La Rue Heart (it’s being released on the 6th) and a couple different washi tapes. She was watercolored with Distress reinkers, cut out and mounted with foam boosters. We hope you’ll play along with us! Just remember to use a stamp that’s sold in the ATS Store! TFL! I used the adorable Sweet November Chrissy stamp, colored with Copics and cut out. I adhered a piece of patterned paper to a 4” coaster and sanded the corners with an emery board. Next I printed the words “days until Christmas!” on a piece of dotted PP, covered it with clear contact paper and cut it out with a Nesties die. Chrissy was mounted over that with some foam tape. I punched 3 holes in the coaster – 2 for the hanging string and 1 for the string to attach the dry erase pen. The hanging string and string for the pen are Timeless Twine. Little decorated cookies! I stamped the Holly Jolly image from the Christmas Carol Circle Stamps set and cut it out with a scalloped circle Nestie. Then I just punched out a little flower for the center and stuck it on with a brad. Wrap the cookie package with a strip of patterned paper and stick on the stamped piece for an easy & cute little giftie! Be sure to stop by the YNS Blog to see all of the other Fun Friday projects! TFL! I printed the Meoples and sentiment and die cut them out with a Nesties die then colored with Copics. I glittered up all the black parts of their outfits and all around them. I used some Timeless Twine, C.C. Designs Mini Banner Die, and the Alphadot set from Paper Smooches. This is for CASology – Thanks and Do You Stack Up – Rainbows. I hope you like it and TFL! I used several sets to make this card, all from Paper Smooches: Birthday Buddies (sentiment), Warm Hearts (first bir), Spring Groves (second bird), Chilly Chums (third bird). All the birds were colored with Copics and the branches were die cut using the YNS Tree Trio die set. This is for Paper Smooches SPARKS challenge – sketch and MarkerPOP – color on non-white paper (I used Kraft). I hope you like it and TFL! The snowman was printed on white cardstock and colored with Copics. Then I covered him with clear laminating paper and backed him with sheet magnet. It was a little tough cutting through all those layers, but still doable! The hats were all paper pieced with patterned paper and colored with Copics. The I covered them with laminating paper and backed them with magnet just like the snowman. My tip is not to use the thinnest, weakest magnet you can find (like I did) just because you think it’ll be easier to cut – the hats have a hard time sticking on top of the snowman’s head because of all the layers. I ended up having to put a little bit of adhesive on each of the hats to hold them more securely. We hope you’ll play along with us at ATS! Don’t forget to use a stamp that’s sold in the ATS Store and you can find the rest of the details at the ATS challenge blog. TFL! This is Merry Mouse Candy Cane – isn’t he just the cutest?! The whole thing was colored with copics except for the bow which I paper pieced. I designed the whole thing in Make-The-Cut – it even cuts the little circles with holes for the string closure. I used some Trendy Twine to hold it together. The envelope and circles are cut from 1 piece of double-sided 6x6 paper. I even had some left over for the paper piecing on the front! You can write a little message in there and a gift card fits in perfectly! I hope you like it! And be sure to check out the YNS Blog for more Fun! TFL! P.S. This is also for Loves Rubber Stamps - Anything Goes. We hope you’ll play along with our Anything But a Card challenge! Everything you need to know is on the Challenge blog and remember to use a stamp that’s sold in the ATS Store! TFL! Hello! Welcome to the Your Next Stamp November New Release Blog Hop! We are so excited this month because we are introducing ANOTHER new illustrator to the YNS family ~ Macy Wong! Her images are so super sweet and we know you are just going to love them! We also have some adorable new Franfou images, and Mabel Designs! If you came here from Jen R.'s blog, then you’re on the right track. If not, please start the hop at Kerri’s Blog. Did someone say prizes??? We have 3 new release prizes hidden along the hop! You must leave comments on all of the DT blogs to qualify for the prize drawing. You have until Friday, November 9th at 12 midnight (EST) and the winners will be posted on the YNS Blog on Saturday, November 10th. The sentiment is from the previously released Christmas Carol Circle Stamps set. I think any of the carol stamps would go great with this cute little guy! For the bird, I paper pieced her and added an extra wing behind her because I thought she looked better that way. I hope this gives you some inspiration to look at your stamps differently! BTW, Karen is also offering a fabulous Hop Special ~ 15% off your entire purchase including sale items! The code is YNSNOV2012. She also has some great bundle deals and some awesome steals in the YNS Bargain Bin! Now it’s time to hop on over to the most awesome & talented & sweet Karen’s blog, but don’t forget to leave me a comment before you go! Happy Hopping! Hi all! Are you ready for a sneak peek of one of the upcoming November releases from Your Next Stamp? I have a peek today using Sing Song Robin which will be released on the day of our New Release Hop – November 6th. I paper pieced the present and parts of the bird and added the notes and sentiment from the same set. I added a touch of shading with Copics and drew the ground line by hand. Be sure to check out the YNS Blog for more peeks! TFL! I used the Santa image from the Meoples No Peeking digi set and a custom card file that I made using Make-The-Cut. All the card pieces (except for the image) were cut with my Zing. The Santa was colored with Copics and cut out leaving a thin white border. We hope you’ll play along with us and remember to use a stamp that’s sold in the ATS Store! TFL! Hello! Welcome to the Your Next Stamp Hop for Hope Blog Hop! You should have arrived here from Suzanne's blog but if not you'll want to start at the beginning of the hop, which is Suzanne. We are releasing a very special set today in honor of breast cancer awareness month. This set was created by YNS illustrator Fhiona Galloway, who is currently battling breast cancer herself. We are dedicating our hop to this very special lady, along with all of the other amazing women who are fighting this difficult fight. We have several special guests joining us so you won’t want to miss all of the gorgeous creations! The Fight Like a Girl stamp set retails for $15.00 and Karen is donating $3.00 from each sale towards cancer research. Are you ready to see what I made with this adorable stamp? For my card, I wanted the pink ribbon to really pop so I colored the image in shades of grey, except for the ribbon. The whole image was colored with Copics. I added a piece of old Basic Grey paper and a sentiment from the same set. Now it’s time to hop on over to Veronica's blog. Thank you so much for joining us for this special hop, and don’t forget that by purchasing this adorable set, you are helping to find a cure for this terrible disease! Hi all! Today starts a new challenge over at the All That Scraps challenge blog. The theme is Anything Goes! So break out any of your stamps that are sold in the ATS Store and play along! I colored her with Copics, paper pieced her hat and dress and added white flock to all the white trim areas. The sentiment is from the Christmas Sampler set from Paper Smooches. I added dots of Stickles all over the tag and hand drew the dotted and dash line frame. To finish it off, I added some organdy ribbon tied with a little rustic twine. You have 2 weeks to play along with our anything goes challenge – I hope you’ll join us! All the info you need is on the ATS Challenge Blog. This is also for Winter Wonderland – Anything but a card (with a Christmas theme). I hope you like it and TFL! Hi all! Today I have a card made for the Paper Smooches SPARKS challenge (inspiration pic). I was inspired very literally by the picture – white object topped with a tiny yellow object on a grey background. Then matted on white and black with a yellow base. I used the All Yule Need (tree and star) and Christmas Sampler (sentiment) sets and a bit of really old Basic Grey patterned paper. The hill was drawn in with a white colored pencil and the star was stamped with yellow ink and colored with a yellow Copic. The finished card is 3.25" x 5". I have a bunch of envelopes for this size card so that's why the odd size! I hope you like it and TFL! Hi all! Sorry this post is up a little late – I totally forgot to write it! This is a reminder post that you still have a week to play in the current All That Scraps Challenge, which is ABC – Anything But a Card. Remember to use a stamp that’s sold in the ATS Store! I used an old Sizzix die to make the shaker frame and the new Holly and Berry die to decorate the front. I colored the gingerbread man with Copics then fussy cut him out and mounted him in the frame with foam tape. Finally, I filled the shaker with tiny seed beads and some fine confetti. We hope you’ll play along! All the info you need can be found on the ATS Challenge blog. TFL! I cut the hearts from the cardstock and foam layers using a heart Nestie and put some heart confetti in. I stamped the sentiment and that was pretty much it for this shaker card! This is for CAS-ual Fridays – CAS card with a heart. I hope you like it and TFL! This is for A Day For Daisies challenge – Pop it up using their image Freehand Butterfly 1, this is the version with music notes. I used the sketch from Unscripted and papers from the MME Follow Your Heart – Be Happy paper pad. I paper pieced the butterfly, fussy cut it out and adhered just the body so that the wings could pop up off the card. I hope you like it and TFL! Besides the sentiment from Joyful Greetings, I used the candy corn and tiny happy face from Sugar Rush. The candy corns were stamped on white cardstock and colored with Copics, and then the background was colored with a black Copic. I stamped the flag piece with the sentiment then sewed it onto the card with a zigzag stitch. This is for the Paper Smooches November Guest DT search, Allsorts – Too cute to spook, Crazy 4 Challenges – Sweet Treat, and Challenge Up Your Life – Autumn/Halloween. I hope you like it and TFL! I actually used 3 different sets to make this: Christmas Sampler (fa la la), All Yule Need (star) and Spring Groves (tree trunk). The trunk was colored with Copics and I put yellow Stickles on the star. I hope you like it and TFL! I cut a snowflake from glitter paper using my Zing, Make-The-Cut and the Seasons Cut-It set from Lettering Delights. Then I stamped the Let It Snow image and punched it out with a 1” circle punch. I then tied the circle to the snowflake with a button and some silver cording. This can be a package decoration or even an ornament or other home decoration. This is also for Divas By Design - Anything Goes and Loves Rubberstamps - Bling. I hope you like it and don’t forget to check out the YNS Blog for all the other Fun Friday projects! TFL! I used the Spookalicious set (pumpkin) and the Sugar Rush set (sentiment) from Paper Smooches and the French Pastry Doily and Mini Fanciful Flourish from Cheery Lynn Designs. I colored the pumpkin with Copics and then stamped the face over the coloring. This is for Cheery Lynn Designs – Black and Orange, the November Guest Designer Search for Paper Smooches and Dutch Dare - photo inspiration. I hope you like it and TFL! Hi all! It’s time for another new challenge at All That Scraps and our theme for the next 2 weeks is ABC – Anything But a Card. Fun! For my ABC project today, I decided to make a mini dry erase board out of a 4” square coaster (since I’ve still got about a thousand left from when I bought them in bulk!). I stamped the adorable new Santa Lula on a 4” piece of patterned paper from My Mind’s Eye in Dark Chocolate ink and gave her just a touch of color in her cheeks with a pink colored pencil. 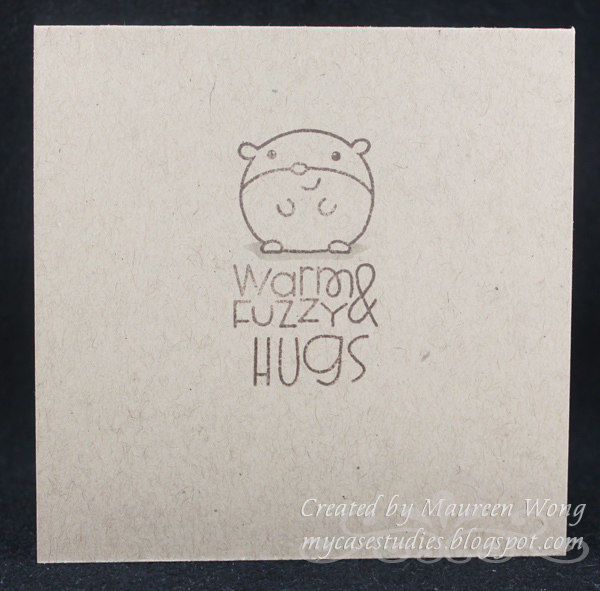 I then stamped To Do with the Alphadot set and adhered the paper to the coaster. Finally, I covered the coaster with clear laminate, trimmed to fit. We hope you’ll play along with us! All the details are on the ATS Challenge Blog. Just remember to use a stamp that’s sold in the ATS Store! TFL! October YNS New Release Hop! Hello and welcome to the October Your Next Stamp New Release Blog Hop! If you've come from Tracy's blog, then you're on the right track. However, if you just came across my blog, please go back and start at Wendy R.'s blog because you won't want to miss a stop! We have tons of adorable new images to show you including some stamps from TWO new artists-woohoo!!! We are so excited to welcome Cory Designs and Mabel Designs to the YNS family. We are all just LOVING the new images, and we know you will too! We also have some new stamps from artist Heather Rolin and two awesome new dies! Of course we have some amazing prizes up for grabs! Just leave comments on all of the DT blogs for you chance to win one of THREE new release prize packs!!! You have until Sunday, October 14th at midnight (EST) to comment. Karen will post the winners on the YNS Blog on October 15th. All of the new stamps and dies are available NOW in the YNS Store PLUS Karen is offering a new release special – 15% off your order using code YNSOCTNR! I cut the tag with my Zing using Make-The-Cut and then used a stamp positioner to stamp the reindeer and sentiment in Dark Chocolate ink. I finished it off with a little bit of Christmas Trendy Twine. For my second project, I decorated K-Cups for gift giving or just to decorate for the holidays! A 2” circle fits the top of the cups perfectly and then I added the stamps (you can punch them out with 1 1/4” and 1” circle punches respectively) with matching scalloped circles of red cardstock. I finished each off with a button tied with Christmas Trendy Twine. The tops have a tiny bit of ATG tape to hold them to the cups so they’re easily removed for use. I hope you like my projects! Now it’s time to hop on over to Peggy’s amazing blog, but don’t forget to leave me a comment before you go so you can be in the running for a new release prize pack! Happy Hopping! I used the Party Posse set for the critter and the "warm & fuzzy" and Alphadot for the "hugs". Everything was stamped on kraft in Dark Chocolate ink. I hope you like it and TFL! I used the Spring Groves set from Paper Smooches, an alpha set from Just Rite for the sentiment and a sketch from Mojo Monday. This is also for the Paper Smooches SPARKS challenge – Woodland Creatures and Loves Rubberstamps – All About Autumn. I hope you like it and TFL! I used the new Snow Noel and the first snowman is wearing the hat from Snow Joy (to which I added white flock). I paper pieced the hat and letters and used a sketch from Unscripted Sketches. We hope you’ll join us and TFL! I stamped images from the Sugar Rush set, colored them with Copics and cut them out. The gumdrop is edged in Stickles and the sentiment is from the same set. I hand drew the grounding line and the speech lines. This is also for The Shabby Tea Room – White with one color and Loves Rubberstamps – another inspiration picture (again I took the colors of the picture – white and green). I hope you like it and TFL! I used Cute Ghost and the Jam Jar Globe stamp and also the matching Jam Jar Globe dies. I was inspired by this FF post by fellow DT member Veronica where she did a Halloween card with the Jam Jar Globe set. I stamped the jar on acetate and cut it out with the die. It’s got a tiny bit of adhesive on the bottom where the lines are and a little on the top right under the jar lid. The sketch is FTL #209 from Clean & Simple Stamping and the 4 different polka dot papers are from the Doodlebug Haunted Manor paper pad. I hand drew the line and the boo! stamps are from Close To My Heart. As you can see, most dies just go straight into the pockets, but for the smaller ones, I use a business card size magnet to keep them from sliding around in the pockets and so I can grab them more easily. You can also store your homemade die templates in the pocket with the die if it’s small enough (that’s the red bit behind the trees die), and finally, you can even stick your cling stamps right to the sheet in front of the matching die! Very handy little trick that I hope will help you with your die storage. TFL and don’t forget to check out the YNS Blog too see which other DT members are playing Fun Friday with me today!